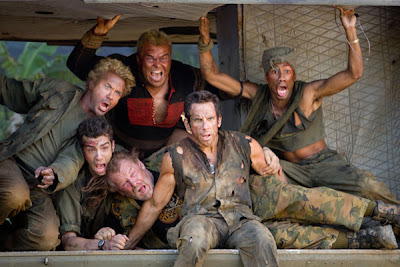 Tugg Speedman: Are you really just going to abandon this movie? We’re supposed to be a unit. Hollywood is hilarious. They’ve got agents ready to cover up dead hookers upon demand and actors with mandatory Tivo in their contracts. They’ve even got heads on the ends of rifles and people biting into live bats. Wait. That isn’t funny. It’s just plain dumb. There’s a fine line between crazy funny and scalping a panda you just killed to wear on your head. 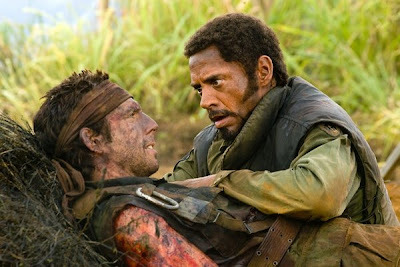 TROPIC THUNDER never figures out how to walk that line, falling on either side of it for some pretty uneven results. Thank you, Ben Stiller, for showing me just how hilarious Hollywood likes to think it is and for reminding me just how far out of step it is with the rest of the world. One minute, you’re laughing hysterically at them. The next, they’re the only ones in on the joke and they’re laughing all by themselves. Lucky for them, most of their laughing happens all the way to the bank. We saw it on Thursday. 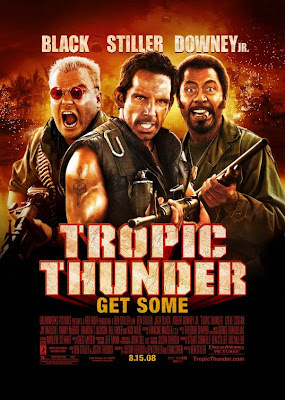 Not a great movie but entertaining.